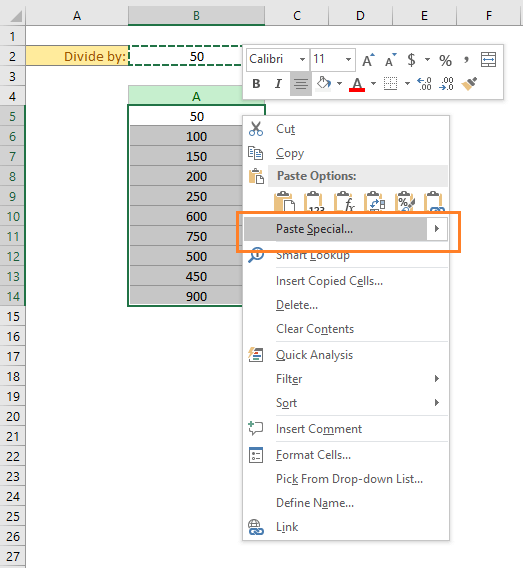 In this article, I will show how to divide columns in Excel. I will show several ways. Choose one that best suits your job. In mathematics, to divide two numbers we use an obelus symbol (÷). But in Excel, we use the forward slash (/) to divide two numbers. 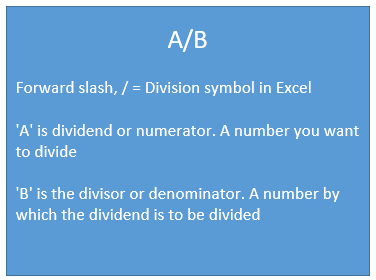 ‘A’ is the dividend or numerator – a number you want to divide by another number (divisor). ‘B’ is the divisor or denominator – a number by which you want to divide another number (dividend). 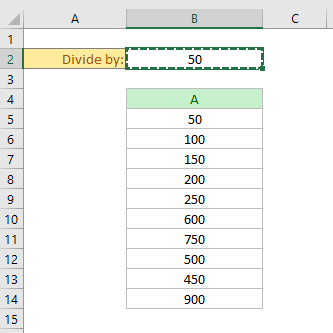 Here are some examples of division in Excel. To know more about operator precedence and associativity in Excel, read this article: What is the Order & Precedence of Operations in Excel? Dividing a cell by another cell or number is same as dividing two numbers in Excel. In the place of numbers, we just use the cell references. Cell references can be relative, absolute or mixed. Here are some examples of dividing cells by another cell or number (image below). We want to divide the values of column A by the values of column B. In the cell C2, I type formula =A2/B2. Press Enter. The formula outputs 10 as 50 divided by 5 returns 10. I select the cell C2 And copy the formula in the C2 to other cells below holding and dragging the Excel’s autofill handle tool. Or you can just double click on the autofill handle tool. And here is the result. On the right side, the formula is shown. 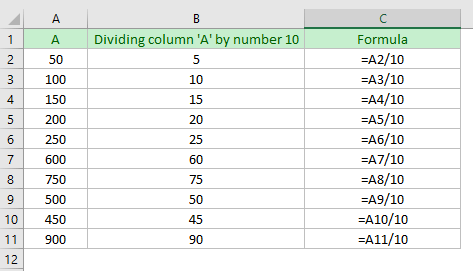 Let’s divide a column by another one using Excel’s array formula. Most general Excel users fear of Excel’s Array Formula. If you’re one of them, read this article: Excel Array Formula Basic: What is an Array in Excel. How an array formula can benefit us in this case? 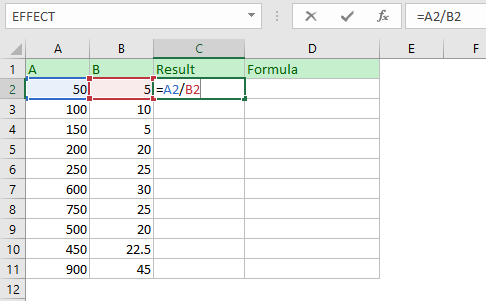 If you want to keep safe your Excel formula to be altered or deleted by your users, you can use the array formula. 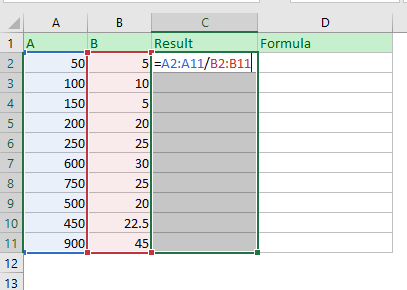 Let me show how you could perform the above calculations using an array formula. Now press CTRL + SHIFT + ENTER (I remember it with the short form CSE) simultaneously. 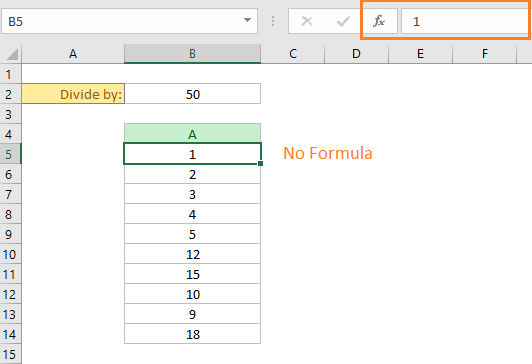 This is the way to make an array formula in Excel. You see the results. A notable thing is: all the cells (C2:C11) are holding the same formula. So, you cannot change the formula of a single cell. 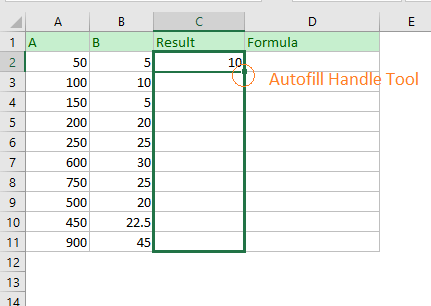 To change the formula, you have to select all the cells and then you can edit or delete the formula. After Editing or Deleting the formula, you have to press simultaneously CTRL + SHIFT + ENTER again. Suppose you want to divide the values of a column by a specific number 10 (it can be any). 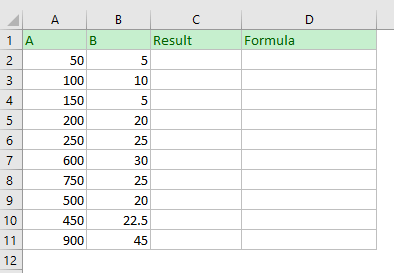 Press Enter and then use the formula for other cells below. Here is the output. 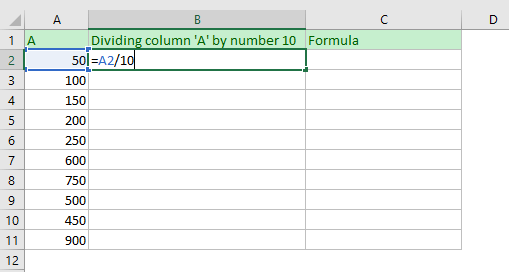 So, the values of column A is divided by a specific number 10. Maybe one day, you might want to divide those numbers by using another number, say 5. It is not wise to edit the formula to get results. We can use this method. In the cell B5, I use this formula: =A5/$B$2. In the cell B2, I have placed the number that will be used to divide the values of column A. Observe the formula. 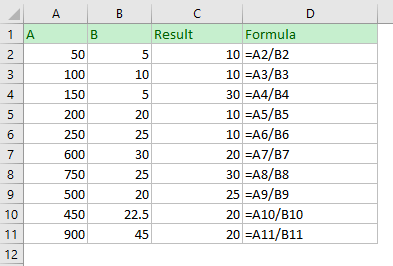 You see I have made the B2 cell reference absolute as I don’t want it to be changed when I shall use the formula for other cells in the column. Now press Enter and use the formula for other cells in the column. Here are the results. In this method, you can divide a column by a specific number without using an Excel formula. 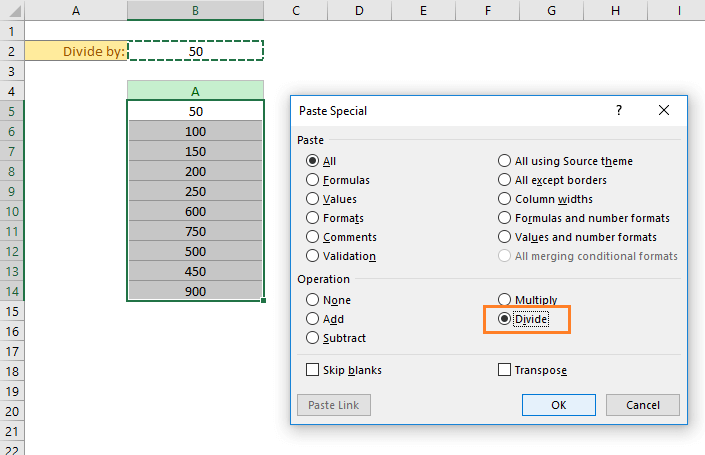 We shall use Excel’s Paste Special feature. We place the divisor in a cell. Suppose in our case, the divisor is in the cell B2. Select the cell and copy the value of the cell (keyboard shortcut CTRL + C) command. All the numbers are replaced by new values (divided by 50). No formulas are seen in the cells. Excel’s Quotient function returns only the integer portion of a division. Check out the differences between the result done with general Excel formula and using QUOTIENT function. So, dividing a column by percentage is actually the same as dividing a column by a number. Here are some examples of dividing a column by percentages. You cannot divide a number by zero. This is not allowed in mathematics. 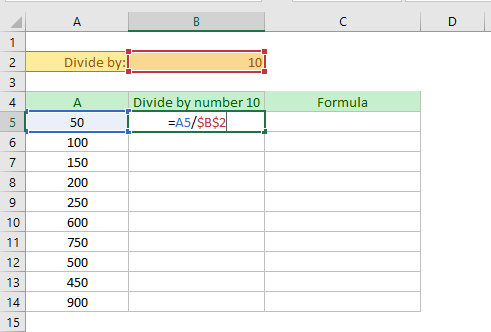 When you try to divide a number by zero, Excel shows #DIV/0! Error. See how I have used the IFERROR function to handle the #DIV/0! Error in Excel. Instead of using the IFERROR function, you can also use the IF function to handle the #DIV/0! Error (following image). 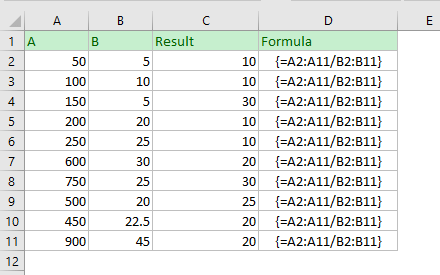 Then I copy pasted this formula for other cells in the column. VLOOKUP Formula to Compare Two Columns in Different Sheets! These are my ways of dividing columns in Excel. Do you know any other methods? I am eager to know. Please let me know in the comment box. It’s really amazing sir , you are great. Thank you for introducing me to the word “obelus” and the quotient function. The description is very well organized and thanks to the developer for provising such knowledge. Thanks, Sarabjeet Singh, for your feedback!